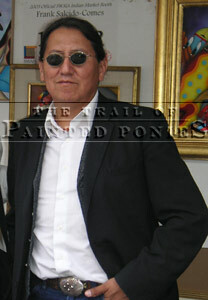 He is a full-blooded member of the Navajo Tribe from the Towering House Clan, born and raised near the Eastern Agency on the Navajo Reservation.As a young boy he attended many traditional ceremonies and as an adult he often dresses traditionally - his dark brown hair pulled back into a chonga knot, a Navajo-style bun men wear at the nape of the neck. But Frank Salcido considers himself a multi-cultural person. While technically he was reservation raised, it was in the "checkerboard area" of the Navajo Reservation where Indian land, public land and private land were mixed together. Yes, there was a hogan in the backyard, and yes, many of his friends were Navajo kids, but just as many "white kids" were friends of his, and if the truth were told, he enjoyed hanging out at their houses more because they had TVs. As for his education, while his grandparents exposed him to Navajo beliefs, the bus that ran past his house delivered him to public school, where he learned to speak perfect English. He came of age in the '70s, and they were exciting times for Native youths. Members of the American Indian Movement were stirring up politics-as-usual, and the times were changing in Indian Country. Although Frank was uncomfortable with political radicalism, a rebel spirit infused his behavior. He wore his hair long and his blue jeans had bell-bottoms. He jammed to Credence Clearwater Revival and, when he graduated from high school, he made a pilgrimage to San Francisco, immersing himself in the alternative music and art scene. On a separate but parallel trek, there was his art. He'd always had a "good natural hand" for drawing, and he'd been encouraged by his teachers to exercise it. His influences were a curious mix: he was fascinated by the traditional images found on animal hides, petroglyphs and ledger drawings, and yet his color choices and style owed more to the psychedelic artwork found on Peter Max concert posters and album covers of the era. The originality of this combination helped him gain acceptance to the Institute of American Indian Arts in Santa Fe, New Mexico, where he earned an AFA degree (Affirmative Fine Arts). Indian Country Today, "sets him clearly apart from the R.C. Gormans of the world. While Salcido likes to paint Navajo women in their velveteen blouses and sateen skirts and squash blossom necklaces, he does so in swaths of bold color that resonate more with a fantasy world than with the muted palette of the Southwest." And that's just the tip of what he is doing that is original. He likes to paint scenes of Indian people interacting with people of different colors and cultures around the world. "Indigenous people from other parts of the planet have much in common," he says. "Asian people burn incense in their religious ceremonies, Indian people burn sage when we pray. Dancing is an important part of life for native cultures everywhere, as is camp life - living and cooking outdoors. Native people everywhere are survivalists. 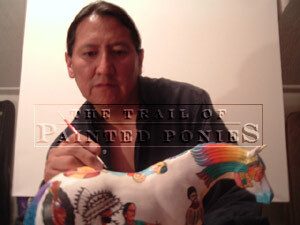 It is this theme that inspired the design for "Native Peoples Pony," an assemblage of native people from Africa, New Guinea, Asia, and more, integrated with images of Indian People from North America, topped by a Navajo medicine man and a Tibetan monk working together on a sandpainting. As for what's coming next, Frank has some "hip, fun stuff in mind." He calls it "Noir Art," and references the pulp images popularized on old detective and romance paperback novels, only in his hands they would be given a contemporary, Native twist. He imagines a painting of Navajo Tribal policeman drawing down on a gangster, only instead of going for his pistol he is reaching for an arrow from his quiver, and a Navajo girl in a skimpy outfit stands in the line of fire, trying to protect her man. 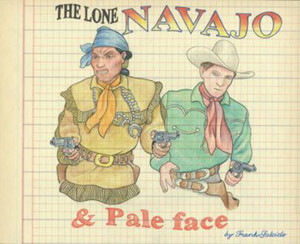 He has already drawn a spoof on the Lone Ranger and Tonto that is titled "The Lone Navajo and Paleface" done on ledger paper. While Frank Salcido may nod to influence of splashy, Peter Max posters, he doesn't look back, and one gets the feeling that the road ahead is going to be unlike anything that has come before. In a Cape Cod-style house in Portland, Oregon. You could almost call it a "Leave it to Beaver" house. It was built in the '40s. I create most of my paintings in an attic studio, while listening to music. I'd have to say the pop artist from the '60s, Peter Max. His bold bright colors made an impression on me that has lasted. Anything by Santana. Every time I go to one of his concerts it's like going to church. Bright red. It's a sacred color to Indian people. A cleansing color. We paint our bodies red for ceremonies. Navajos like to color their moccasins red. The Dahli Lama, because he has dedicated himself to trying to change the world and make it a better place. They came from my grandmother. "Stay in school. Always try to be better at whatever it is you do." It's what I tell my own kids.